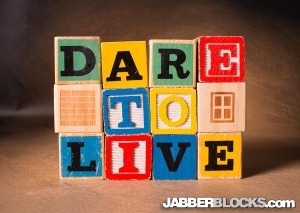 Sometimes it feels like an act of rebellion to actually ‘Dare to Live’ as opposed to daring to sustain life. “Live a little” as the old saying goes – dare to live a life that is your own, full of things make it worth living. Dare to take time out for yourself and your interests.Dare to Live should not be a bold statement, but it’s a great reminder to look at each day.